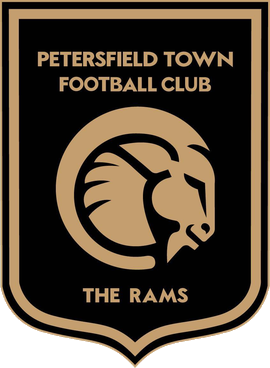 Petersfield Town were founded in 1993 after the demise of Petersfield United, who had folded after being refused permission to transfer from the Isthmian League to the Wessex League amidst serious debts. Town initially took their place in what is now the Premier Division of the Wessex League, staying at this level for four seasons before suffering relegation to Division 1 of the Hampshire League. After one season at this level, the club suffered another relegation and fell into Division 2, finishing runners-up in their only season at that level before the league was restructured. 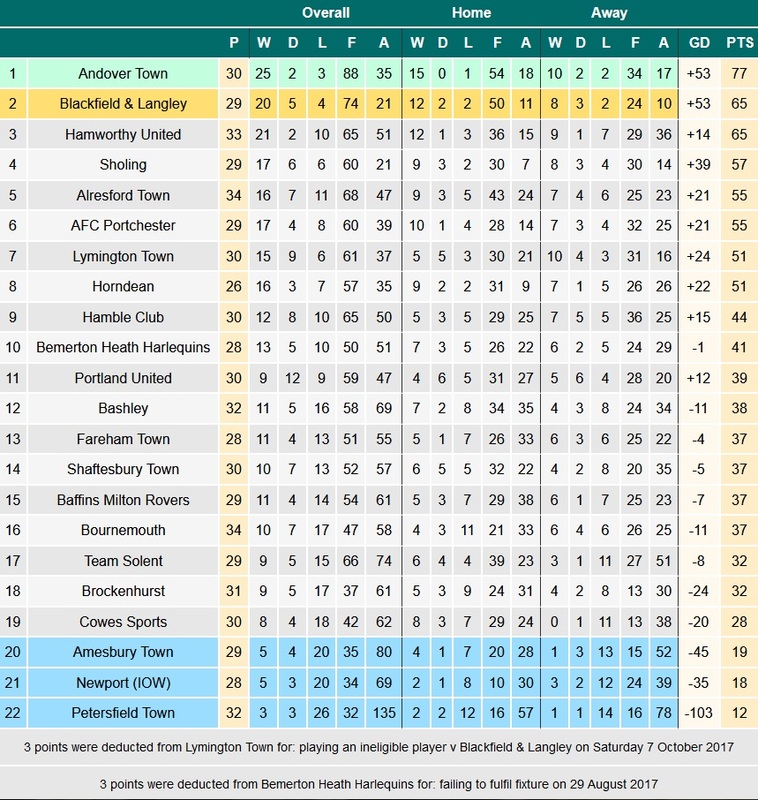 Because of the restructuring, the club were essentially promoted twice, as they were placed in the newly-formed Premier Division of the Hampshire League. After five seasons in this league, an expansion to the Wessex League for the start of the 2004/05 season saw the club elevated to its newly-formed Division 2, despite finishing 14th out of 18 teams in the Hampshire League Premier Division in the 2003/04 season. Two seasons later, Division 2 was renamed to Division 1, and this was the level that the club remained at until the 2013/14 season when they won the title to earn promotion to the Premier Division. 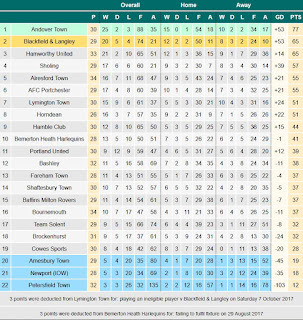 The following season saw the club win the Premier Division in dominant fashion, earning promotion to the Southern League Division 1 Central. Their first season at Step 4 saw the club finish a respectable 13th in the league, but last season things started to go very wrong for the club and, winning just two games all season, the club were relegated back to the Wessex League Premier Division for the current season. However, this relegation hasn't seen the club's fortunes improve, as they currently sit rock-bottom of the league and look set for a second consecutive relegation. In the FA Cup, the club's best run saw them reach the 3rd Qualifying Round in the 2015/16 season, beating Moneyfields, Weymouth and Cirencester Town before losing 1-0 at home to St Albans City. In the club's two seasons in the FA Trophy, they never won a game, losing 3-1 at home to Winchester City in the Preliminary Round on both occasions (although they did take them to a replay to do so last season). As for the FA Vase, the club's best run saw them reach the 2nd Round in the 1994/95 season, beating Hamworthy United, Christchurch and Southwick before losing 7-0 at home to Taunton Town. After the previous two weeks of terrible matches, I wasn't feeling especially inspired going into this weekend. However, I had nothing better to do so decided to go to a game anyway. Initially, I was seriously considering visiting Bracknell Town for their FA Vase Quarter Final against Marske United (which they ended up losing 3-0), but ultimately decided against it due to it being my most local 3G option that I can feasibly reach by train from University; I wanted to go, but I felt it would be better to save the 3G for a day when it was truly needed, and yesterday certainly wasn't such a day. As such, come Friday I wasn't anywhere near making a decision, so I decided to look at nearby fixtures on the Groundhopper app to see if anything would strike my fancy. Upon doing so, two games ended up standing out from the rest: this one, and Highmoor Ibis' home game against Longlevens. In terms of choosing one over the other, I wasn't exactly sure for a couple of reasons: firstly, I had already passed on a possible visit to Highmoor back in December (albeit weather-related, so I didn't have too much choice in the matter), but at the same time Petersfield seemed slightly more likely to have some goals in it. As such, I asked again on Twitter like I did last week, but all I got back was one highly negative response about Highmoor and a comment from the club themselves. With this not exactly being massively helpful, I decided to leave my decision until the morning, looking at trains to decide which would be easier to do and, on that front, Petersfield was by far the superior option, with it being a short journey with no changes from Guildford (this proved to be the right choose, as the game at Highmoor ended up finishing 0-0). Decision made, I ordered my tickets, had lunch and then left the flat just before 1pm to make my way to the station. The train journey was as easy as expected and, after a 15 or so minute walk from the station to the ground, I arrived at the ground shortly before 2:30pm, paying a steep £8 for admission and £2 for an average programme (both massively overpriced for Step 5, in my opinion). I then did my usual circuit of the ground before waiting for kick-off by the main stand, moving across to the other side early on due to some annoying children at the adjacent skate park throwing sweets and bottles over the fence and just being irritatingly loud. While the table made for similar reading to last week's game at Abbey Rangers, I was slightly more optimistic due to the fact that Team Solent had scored a lot more goals than would be expected from a team near the bottom, while Petersfield had conceded over 100 goals so far this season. 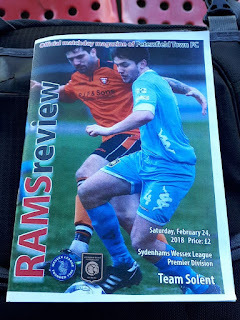 As such, a goal-fest seemed possible, although that depended on if Team Solent could do a better job away from home than they seem to have generally done this season (the disparity between their home and away form is frankly baffling, and I am at a loss to explain it, really). Well, after the last two weeks saw me enduring some utterly miserable and terrible football, today's game was a significant improvement, with both goals and some degree of actual quality on display, primarily from the away side. However, it was the home side who made the better start, earning themselves a penalty in the 3rd minute after a clumsy challenge just inside the box. Petersfield's Luke Kendall stepped up to take it, but his effort was tame and it was an easy save for Team Solent's Bradley Banda (who is also the goalkeeper for Gibraltar's under-21s), with him simply diving to his right and allowing a defender to clear for a corner, which in turn was easily cleared. Petersfield continued on the front foot in the tenuous early stages of the game, but for all their good play in the opening 15 minutes, they were unable to carve out many notable chances. As such, though the goal was against the run of play, it wasn't at all surprising when Team Solent took the lead after 17 minutes: a ball was drilled into the box and was somehow kept in play by the Solent attacker, who flicked the ball over his head to provide Julien Stahler the opportunity to head into the net from 5 yards. 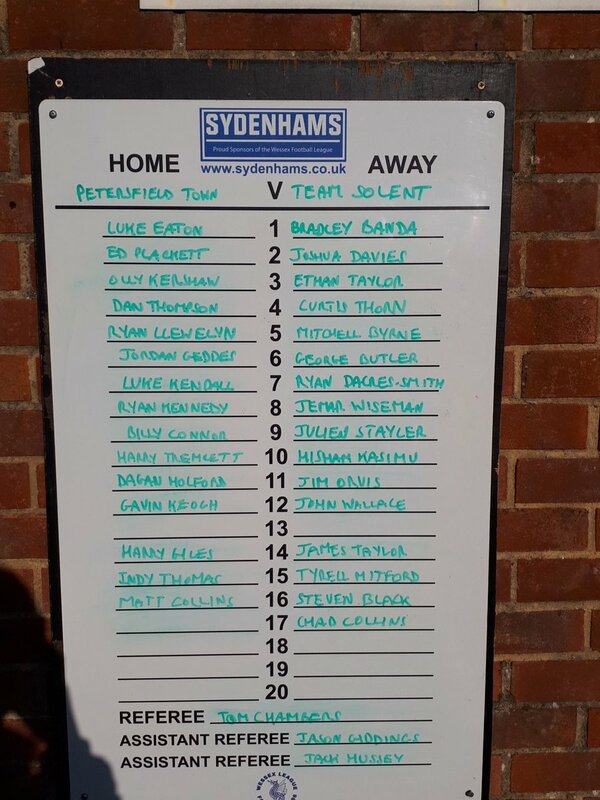 In any event, Team Solent had their lead, and this caused Petersfield heads to drop and allowed Solent to start to exert some control over proceedings. However, it was Petersfield who should have scored next, a corner not dealt with by the Solent defence and seemingly headed into the net, only to be almost instantly cleared out of the net by a defender: from where I was standing, I thought that the ball had crossed the line, but it was a tight call and the goal wasn't given in the end. After this, it then felt like a matter of when Solent would score another and then how many more they would score, as they started to pin Petersfield back in their own half and create more and more chances. However, it took until the 40th minute for the away side to double their lead, a free kick played into the box from 35 yards out and eluding the statuesque Petersfield defence to allow Jim Orvis to tap in at the far post. The rest of the half somewhat petered out, with Solent not needing to put much effort in to maintain control of the game, while Petersfield tried their best to pull a goal back and give themselves something to build on for the second half. However, much to their manager's understandable frustration, this didn't prove to be the case and Solent went in at half-time with a comfortable two-goal lead. 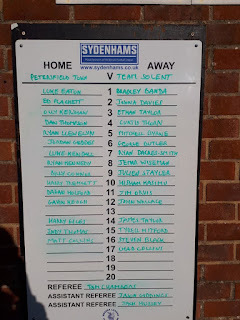 The second half started in much the same vein as the first did, with Petersfield making the better start while Solent took a while to properly grow into the game. In the first 20 or so minutes of the half, Petersfield looked significantly more organised than they had done at any point in the first half, and the decision to bring on Harry Giles at half-time seemed inspired, with him proving extremely difficult for the Solent left-back to deal with; if Petersfield were to pull anything back, it would likely be because of his efforts. However, despite him getting in behind the Solent defence time and time again, none of his team-mates were able to match his efforts, with the ball often being played into a Petersfield attacker in the box, only for the attacker to take too long and allow the defence to regroup and stifle the chance. The game largely proceeded like this for a while, but as Solent grew back into the game the amount of chances Petersfield were able to create slowly decreased. Then, in a game that had been played out in a reasonably "friendly" fashion (by which I mean there seemed to be no bad blood between the two teams, and there weren't really any nasty challenges flying in), tempers almost flared over just after the hour mark, when Julien Stahler slid in for the ball but instead took out Petersfield's Olly Kershaw (who was also sliding in for the ball), with his studs up. Fortunately, the referee - despite being bemoaned by both sides for his questionable leniency at times - was quickly able to defuse the situation, with Stahler being booked and then promptly substituted, replaced by Tyrell Mitford. Five minutes later, Team Solent scored their third to essentially end the game as a contest: a long ball was played forward and Solent's Hisham Kasimu was able to outrun and out-muscle the defender to get the ball before calmly shooting round the goalkeeper to make it 3-0. 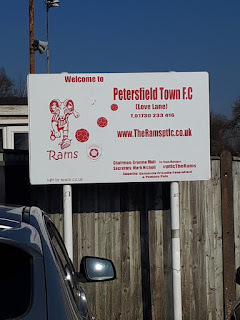 With no way back into the game for Petersfield, things largely petered out to the point that there was very little of note for the remaining 25 minutes, with profligate finishing letting down both teams on the few occasions they were able to get forward and create a decent chance. However, Solent's Kasimu and Mitford in particular kept on trying and kept creating decent chances, with Kasimu getting a chance similar to his goal in the 90th minute, except this time shooting straight at the keeper rather than round him into the net. Overall, while this game was far from a classic and probably won't live too long in the memory (it was fairly one-sided throughout), it was a massive improvement on the last couple of weeks, so in that sense I'm satisfied and won't complain too much (or, at least, not as much as I normally would after a game like this). Either way, the result was pretty predictable in the end, with bottom-club Petersfield suffering another defeat on their way to a second relegation, while Solent picked up just their fourth away win of the season to move more comfortably clear of the relegation places (barring a miraculous run from Newport (Isle of Wight) or Amesbury Town, I would imagine that Solent are more or less safe this season. Ultimately, while this wasn't the perfect game of football, I still had a decent day out and actually felt like I enjoyed myself at a groundhop for the first time in a few weeks so, other than the admission price and programme price both being too high, I don't feel like complaining too much. As for next week, the original aim had been to visit Thurrock before they fold at the end of the season, but instead I'll likely be visiting Dorking Wanderers at their current Westhumble ground, before they move into Meadowbank at the end of the month, with my visit to Thurrock instead likely to come on the 17th of March. However, this does depend on whether "The Beast from the East" happens or not and, if it does, what impact this has on the weather for next weekend: here's hoping the impact is minimal. Love Lane is a ground that is delightfully ramshackle and oozes with character, but at the same time feels as if it is in need of some serious love and work in places. The main area of seating is found in the old main stand on the far side, with a seating capacity of around 200 (although many of the seats are either broken, or look like they haven't been cleaned in a long, long time). Directly across from this is a smaller area of covered seating, with bench seating for around 20 or so people situated in front of the First Aid building, protected from the elements by a scaffold roof. Next to this is perhaps one of the most bizarre areas of covered seating and standing that I have ever seen, with a long scaffold roof covering a single row of 50 seats, behind which is ample room for people to stand (probably able to hold at least another 50 people, if not more): presumably, this area of cover was added to satisfy the ground grading criteria for Step 4, but it's definitely an unusual way of doing that when most clubs simply purchase a 50-seater Atcost stand or an Atcost terrace. However, I have to say I like this approach more as it's something different that gives the ground even more character. The rest of the ground is open hard standing, with little room for any kind of expansion (although, with the club's current downwards trajectory, that is unlikely to be necessary in the near future, at least). Overall, the ground has a capacity of 3,000, although it would amaze me if this many people could actually fit in the ground.